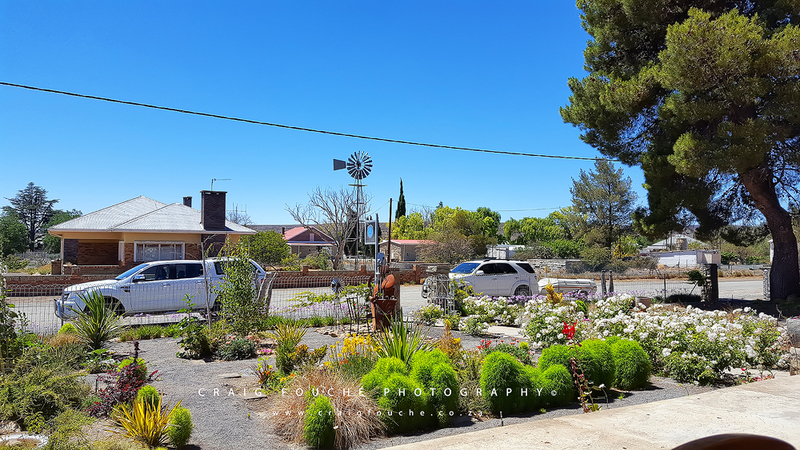 At the drop of a hat, my wife and I decided to travel and visit this quaint little Upper Karoo town of Sutherland – South Africa over the Christmas holidays. During my booking, I was very surprised to learn that most of the B&B’s were fully booked! 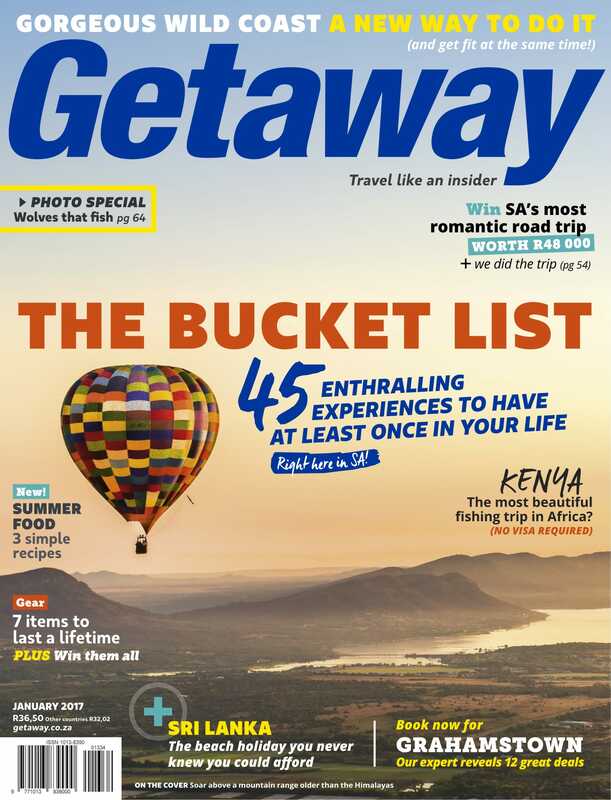 Most travellers come from the North (Gauteng) and head to the sunny beaches and grand vineyards of Cape Town and the surrounds for their annual holiday break, and usually stop over at Gariep Dam or Beaufort-West. Sutherland on the R354, lies 110km from charming Matjiesfontein on the N1 / R354 junction. This is really an off the beaten track detour, which is off of the main N1 highway from Johannesburg to Cape Town; it was these travellers that had filled the B&B establishments of Sutherland! Saying that, Sutherland is experiencing a lot of visitors, those seeking the peace and quiet tranquillity of the Karoo. Vast, remote, open spaces, silence, serenity and dramatic landforms combine with an extreme climate and unique vegetation to make up the alchemy called Karoo magic. The dust and wind, Petrus and Johannes with Vlekkie and Ou Boet the dogs returning with the sheep and goats in the evening to the kraal, Oom Karel Witbooi and Tannie Saartjie Plaaitjies and a few farmworkers from the neighbouring farms on their usual trek to town on their donkey cart are constant reminders that this is the Karoo. That’s what visitors fall in love with. The xerophytic vegetation consists of aloes, mesembryanthemums, crassulas, euphorbias, stapelias, and desert ephemerals, spaced 50cm or more apart, and becoming very sparse going northwards into Bushmanland and, from there, into the Kalahari Desert. 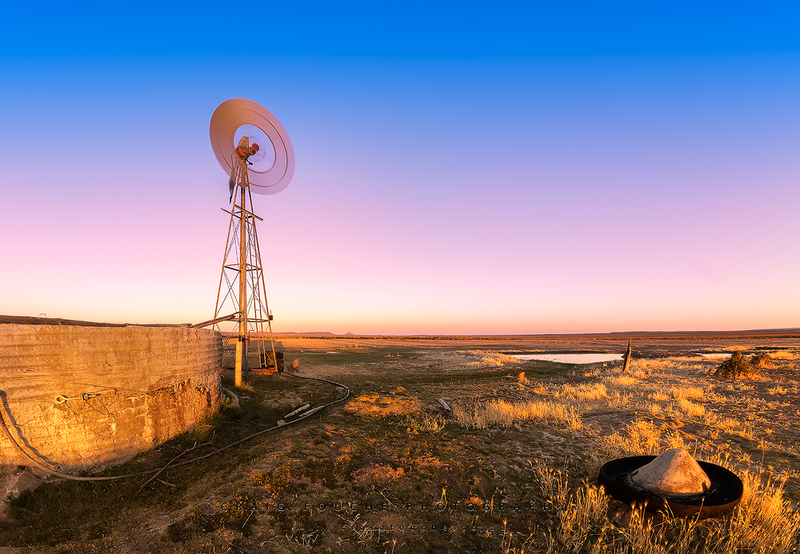 The driest region of the Karoo is however, its south western corner, between the Great Escarpment and the Cederberg-Skurweberg mountain ranges, called the Tankwa Karoo, which receives only 75 mm of rain annually. 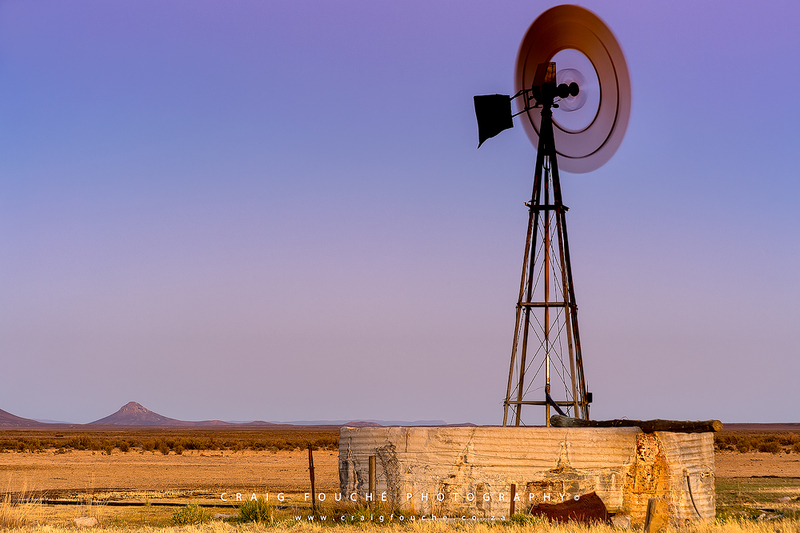 The eastern and north-eastern Karoo are often covered by large patches of grassland. The typical Karoo vegetation used to support large game sometimes in vast herds. 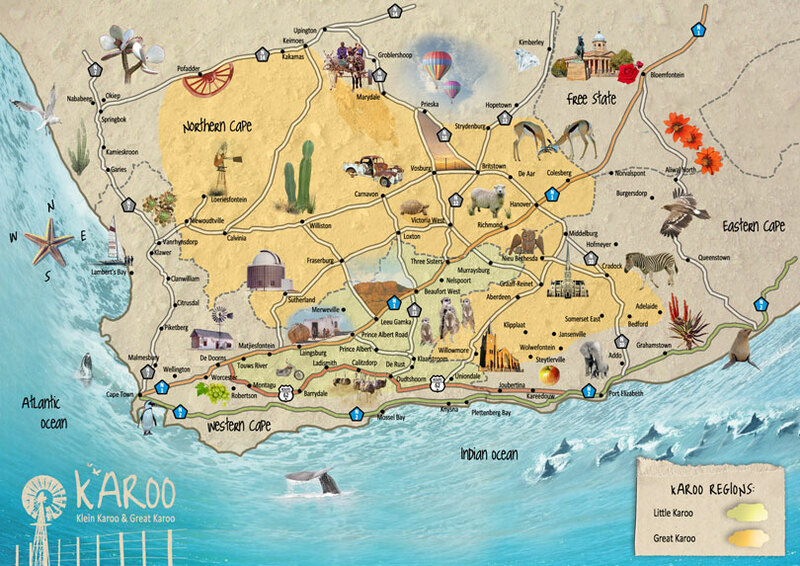 The Karoo is sharply divided into the Great Karoo and the Little Karoo by the Swartberg Mountain Range, which runs east-west, parallel to the southern coastline, but is separated from the sea by another east-west range called the Outeniqua –Langeberg Mountains. The Great Karoo lies to the north of the Swartberg range; the Little Karoo is to the south of it. The Little Karoo’s boundaries are sharply defined by mountain ranges to the west, north and south. The road between Uniondale and Willowmore is considered, by convention, to form the approximate arbitrary eastern extremity of the Little Karoo. Its extent is much smaller than that of the Great Karoo. 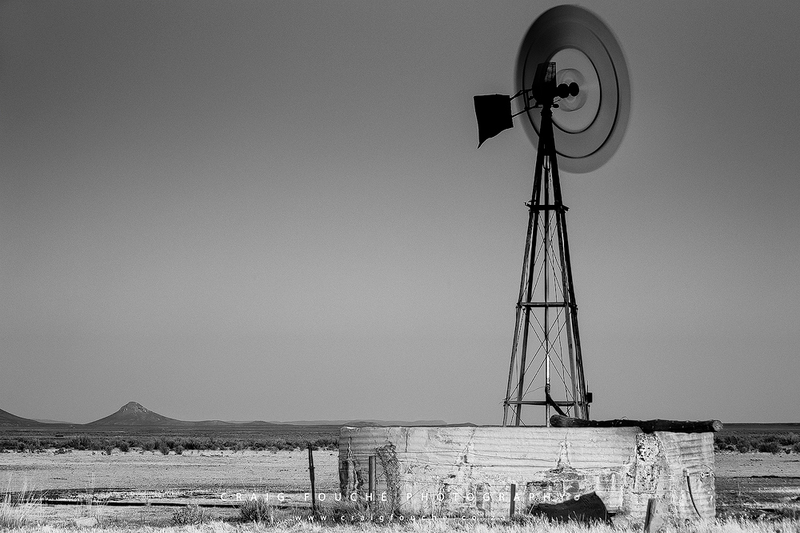 Locally, it is usually called the Klein Karoo, which is Afrikaans for “Little Karoo”. Jannie of the Blue Moon Guesthouse was able to roll a stone out of our way to accommodate us during this busy time at The Artist’s Cottage, with meals at The Blue Moon Guesthouse. 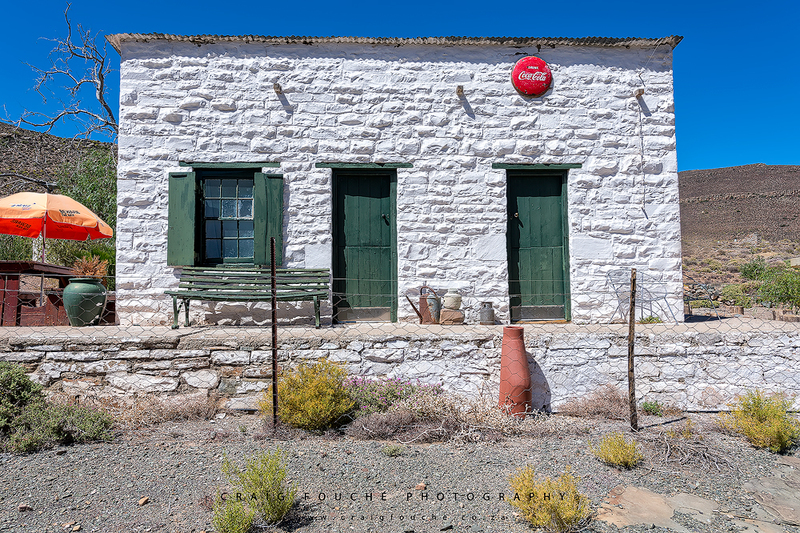 His guesthouse is a charming almost 100-year old sandstone Karoo house with five bedrooms and restaurant. His staff are very friendly and helpful. 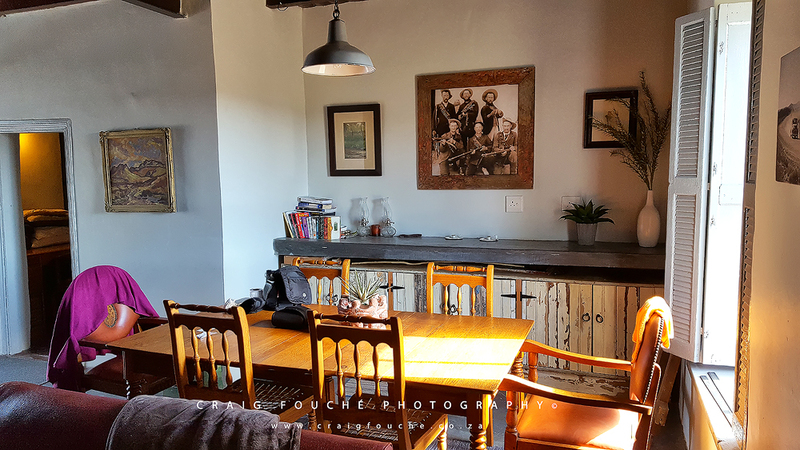 They serve the most delicious Karoo cuisine all day long, their breakfasts are either served indoors or out on the stoep / verandah, and the most filling, delicious farmstyle breakfast you could wish for! The Artist’s Cottage is one of the oldest houses in town, it doesnt look like much from the outside, step inside and be impressed. 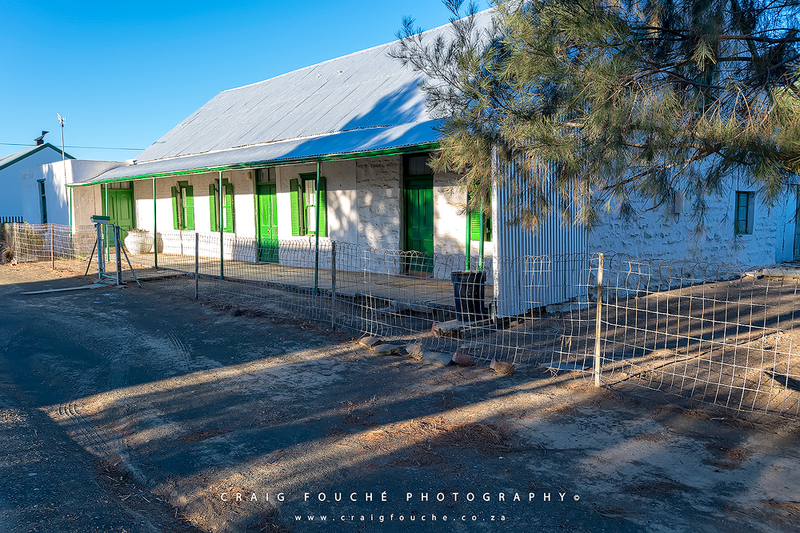 The cottage is a charming, typical Karoo-style building which has been renovated with a modern flair yet remains true to its original style! 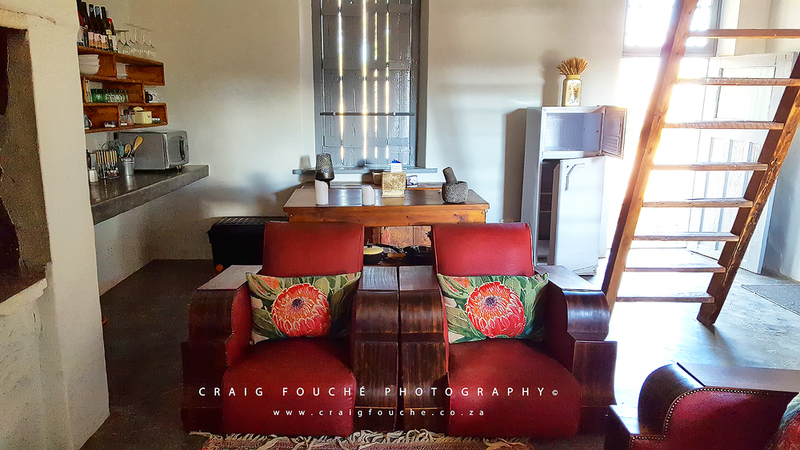 If you expecting modern, upmarket lodging from the likes of a Sandton B&B, forget it, this the Platteland where real hospitality and genuine friendliness is far better than the hustle and bustle of the city-slicker’s expectation. Here you go back in time and to the real thing! Platteland simple living at its best. Nothing is complicated here, it seems the most stress that anyone should endure is when the rains don’t arrive on time, or where the snow has become too much – the diesel in your bakkie and the water pipes in your home freezes and you are unable to keep warm! 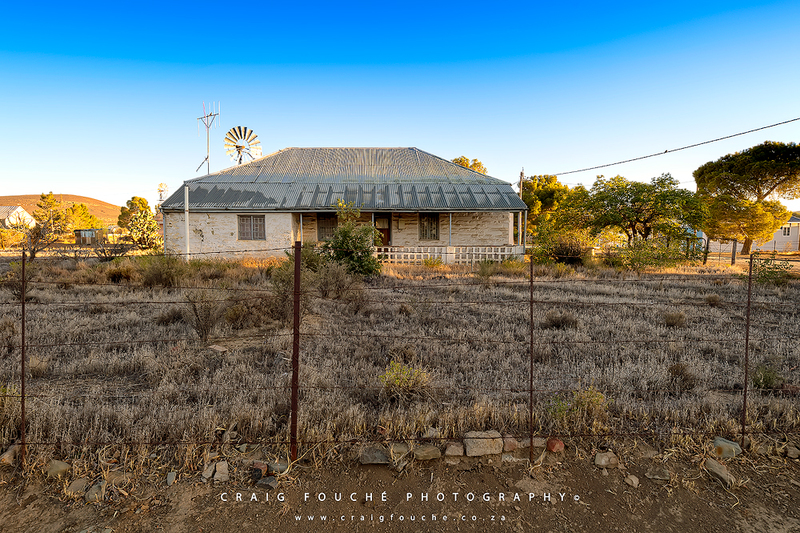 The tranquility and stillness of the afternoon, the slow turning of the windmill in the cool breeze, the chattering and chirping of the Karoo birdlife, these were the only sounds to be heard whilst we enjoyed tea on the stoep / verandah. 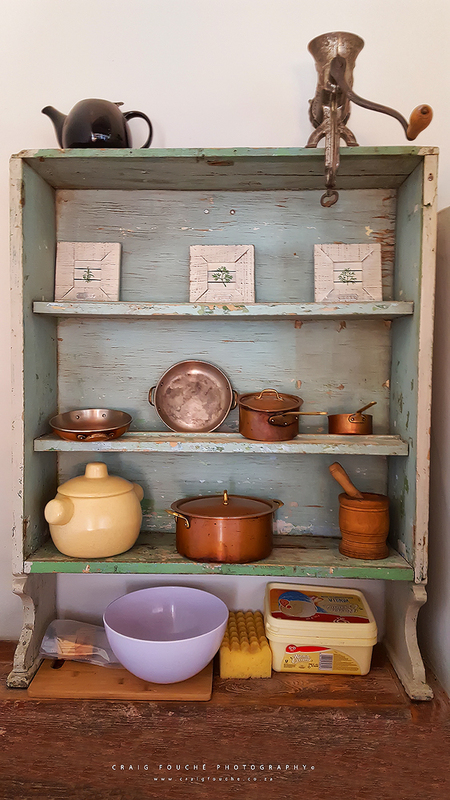 Whilst sitting on the stoep, I was instantly reminded of my childhood, of the locally produced Afrikaans comedy drama – Koöperasie stories (1982–1987) set in a small Afrikaans town. 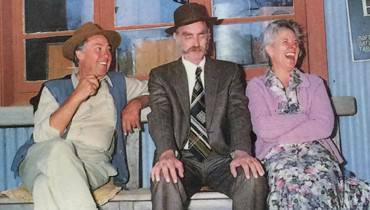 This comedy was filmed on location in the mining town of Cullinan, about a very close-knit community always gossiping about each other, “Ja, so is die mensdom, Mietie!”, with “Oom Genis” usually bearing the brunt of the gossip which starred Alex Heyns as Oom Botes, Jacques Loots as Genis, Marie Pentz as Mietie, Emgee Pretoruis as Veldsman and André Verster as Dominee. Earlier in the day, I had passed the closed famers Co-op in town, and this setting just reinforced those memories. Sutherland was founded in 1723 as a church and market town to serve the area’s sheep farmers. 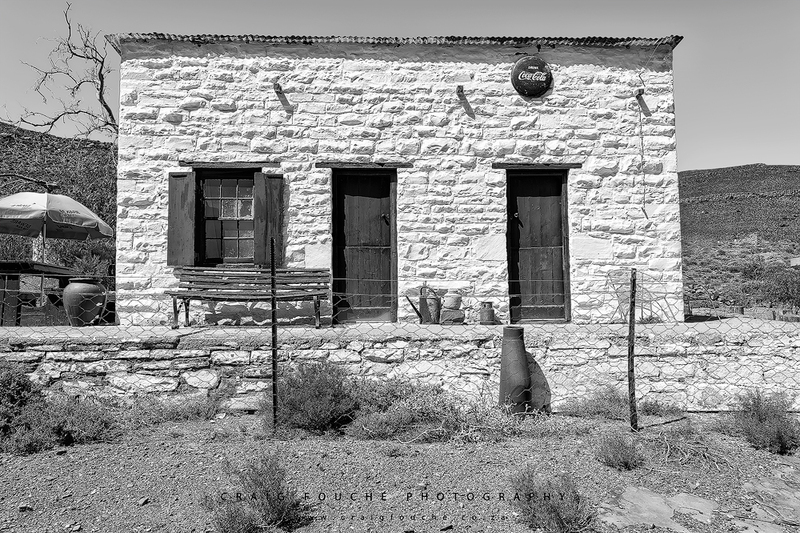 By 1872 the town had a population of 138 registered citizens living in 19 houses. 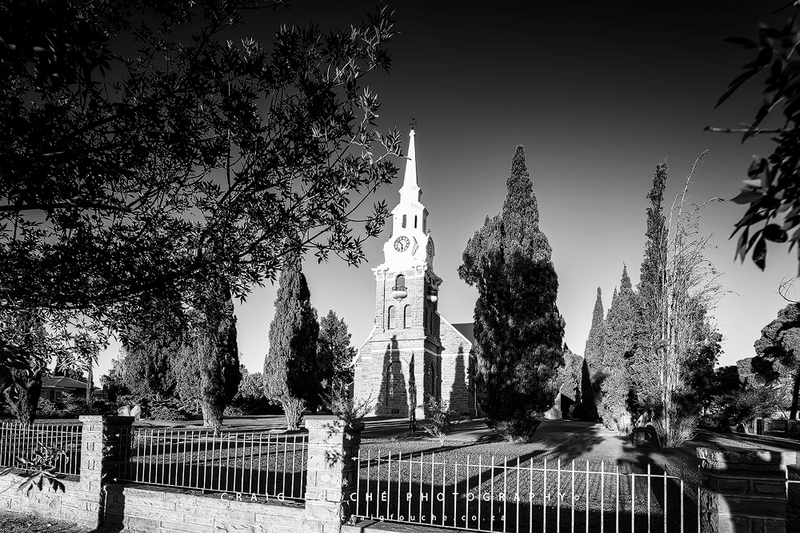 The large Dutch Reformed church in the centre of Sutherland was built in 1899. 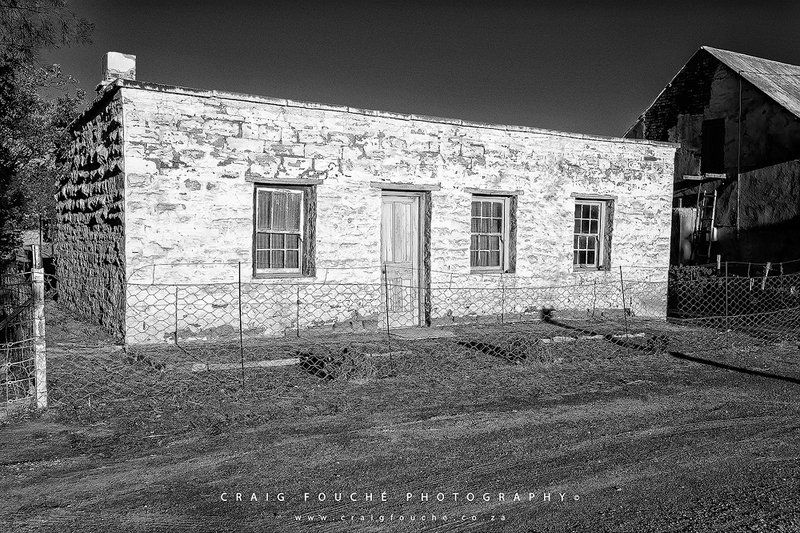 The first Europeans to settle in the area were sheep farmers who got there via the Forgotten Highway (the road between Ceres and the Karoo), so called because it was the main highway to the north before the N1. 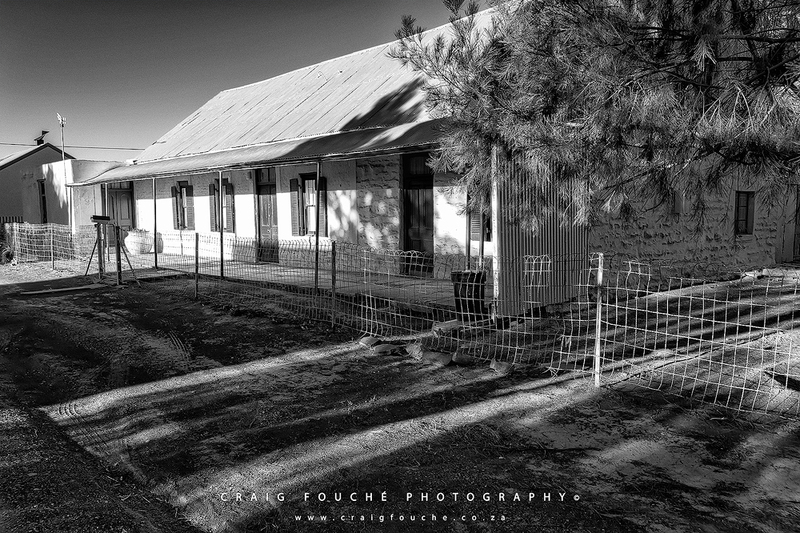 During the Anglo Boer War, the church was used as a fort by garrisoned British soldiers. During the war a number of engagements between British and Boer forces occurred in the town. In one such engagement, a force of 250 Boer commandos attacked the local British garrison for 10 hours. The ruins of a fort can be found on the outskirts of town on the hill called Rebelskop. This was named after this engagement. 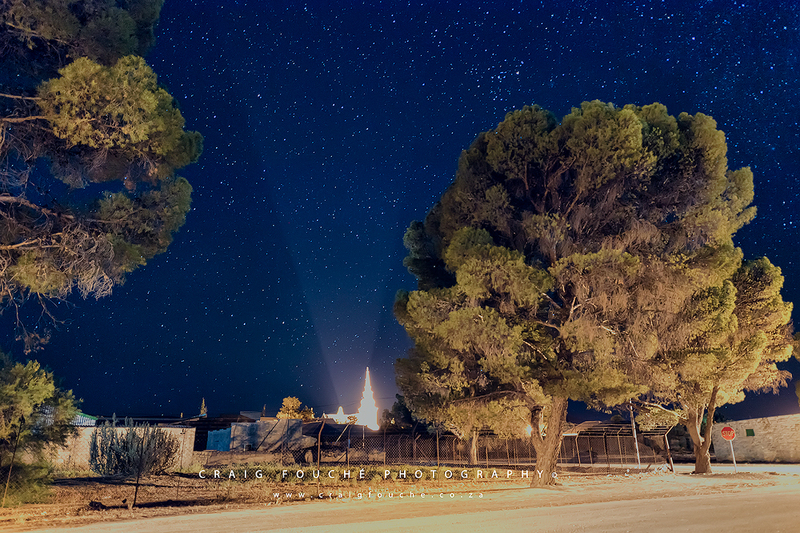 As one enters the town from the Matjiesfontein side, the Anglo Boer War cemetery can be found on the left-hand side and can be visited. Major economic activities include tourism and sheep farming. The area includes at least twelve registered B&B’s, guest houses and guest farms. 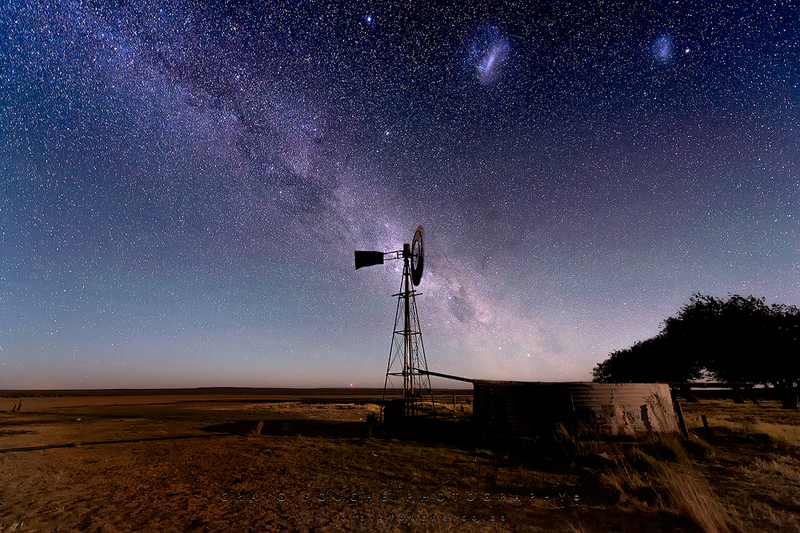 The nearby South African Astronomical Observatory also plays a significant role in the town’s economy and is a major driver of tourism to the area. 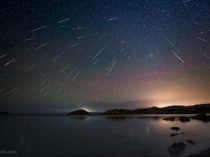 The town also has a number of bars, restaurants and an amateur astronomy observatory that service the tourism sector. Sutherland has recently gained in popularity, with many Capetonians buying property in the town and many more visiting on weekends and vacations. 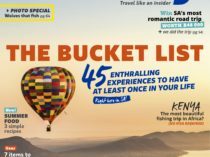 The tiny Upper Karoo town of Sutherland – South Africa is a town with about 2850 inhabitants in the Northern Cape province. The main road is tarred, whilst the side roads are gravel adding to the Platteland charm that it oozes. There are a few well-known stores in town – OK Foods and PEP, butcher shops, a bank, post-office, two fuel stations, police station, church and a farmers co-op. It lies in the western Roggeveld Mountains in the Karoo. It is famously known as the coldest place in South Africa with an average yearly temperature of 11.3 °C and an average annual minimum temperature of 2.8 °C; although the farm Buffelsfontein holds the official lowest temperature record in the country, of −20.1 °C. Snowfall is common in winter. The coldest temperature recorded in Sutherland was −16.4 °C on 12 July 2003. Sutherland has a semi-arid climate and is well suited to sheep farming. It normally receives about 169mm of rain per year and because it receives most of its rainfall during winter it has a Mediterranean climate. The lowest rainfall (4mm) in January and the highest (28mm) in June. 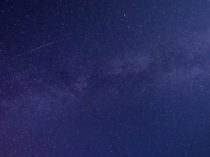 It is also called the ‘Gateway to the Universe’ as it is the location of the most powerful telescope in the Southern Hemisphere – SALT and has the best night skies in Southern Africa. 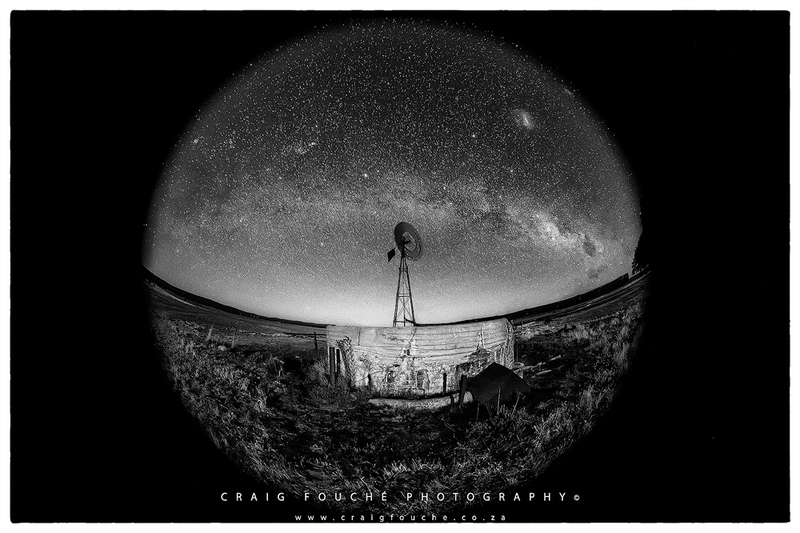 The SAAO – South African Astronomical Observatory takes advantage of the local climate and remoteness of the Upper Karoo – an area that is flat and arid, and therefore cloudless, for most of the year and also very undeveloped with clear unpolluted and very dark skies – except for an inverted ‘blanket’ made of zillions of stars which looks like someone had thrown a bucket of glitter into the sky. It is located approximately 15km from town. 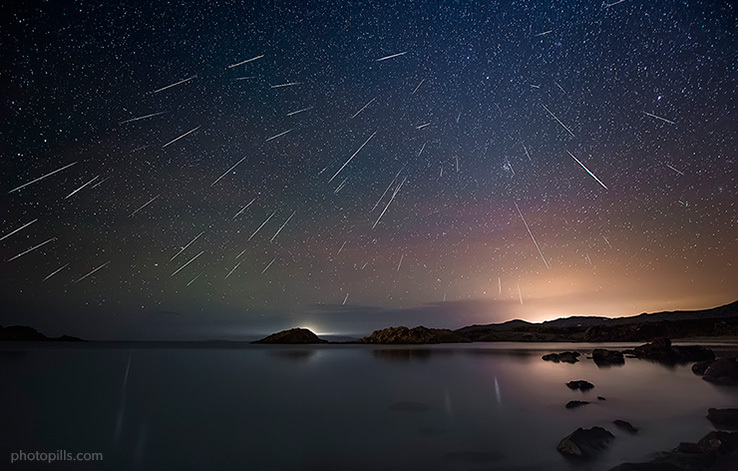 Sutherland has its own Dark Skies reserve – Spaceport Karoo, which is South Africa’s first and largest Dark Sky Reserve. 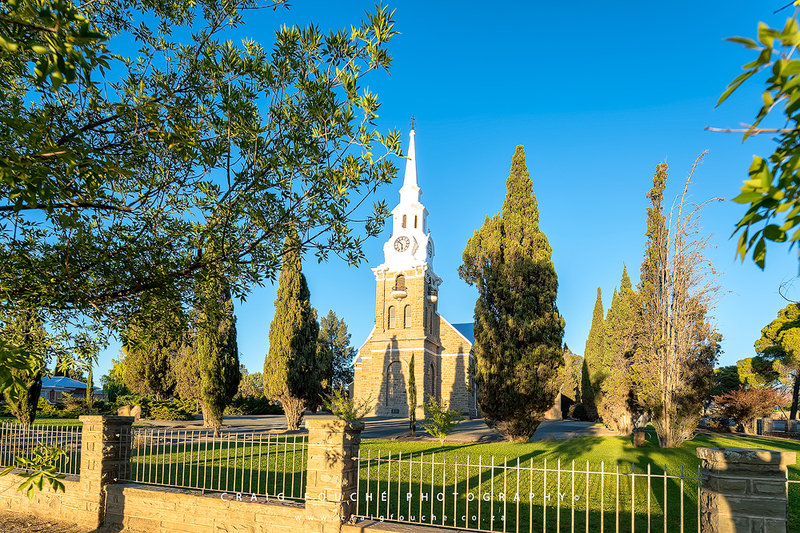 While Sutherland is most famous for its stargazing and SALT, there are many other things to see, do or simply enjoy around this small town during the day. At 1450-1500m above sea level, snow is guaranteed in the cold winter months, as is a myriad of flowers after the summer rains re-awaken the Karoo. There are walking and mountain bike trails around the town, newer mountain bike trails being developed at Rogge Cloof as I write this blog, horse-riding and just enjoying the wide open space around you. If you looking for peace and quiet, you have found it! Your ears ring in the stillness of Sutherlands’ quietness. 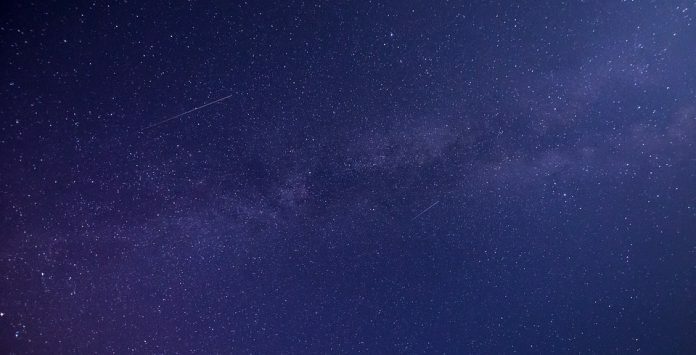 During 2017, I had wanted to shoot the night skies with a few ideas in mind. This was my perfect opportunity to do so. Getting up early in the morning to shoot sunrises, is not my strong point. With a bit of gentle coaxing, my wife Dominique got me out of bed to capture the sun painting up the NG Church in town. I am glad I got up for it, as it is best photographed as a sunrise shot. It was a rather normal chilly morning for us, being summer, but a normal morning in Sutherland. 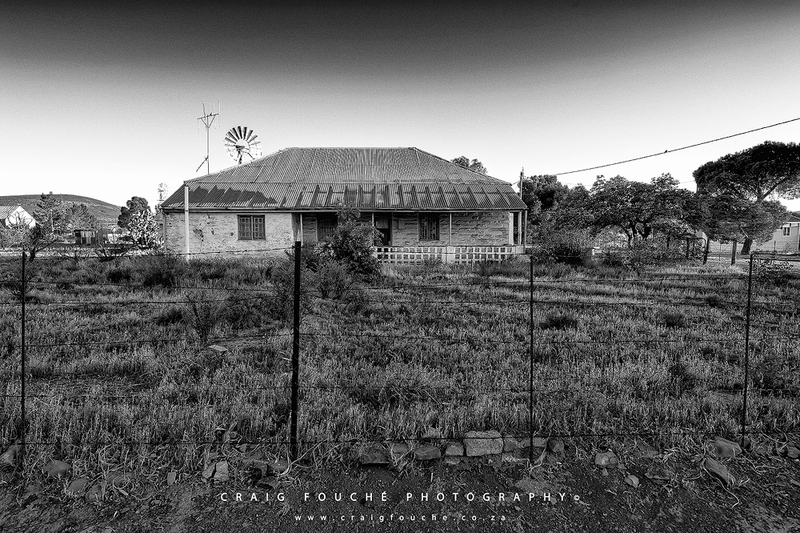 I was intrigued by the old traditional Karoo architecture of the dorp, and captured a few images there too. I had contacted Rogge Cloof at the suggestion of my friend Francios of Manic Cycles Worcester, and met with André and Corlia, two wonderful hosts that have a heart and passion for the Karoo and Sutherland. Francios has supplied Rogge Cloof with 6 fat bikes that are very comfortable to ride, actually designed for snow, which will be great to ride in the winter snow and during the other seasons. 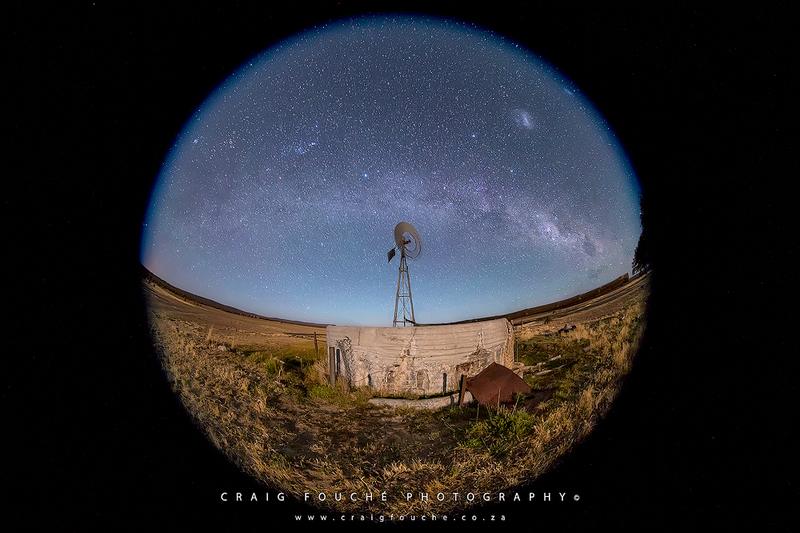 We enjoyed a lovely afternoon chat and a game drive while I scouted for locations to shoot my night sky images. There are a variety of game and antelope at Rogge Cloof, that being Springbok, Eland, Grysbok, Gemsbok, Zebra, Black Wildebees, Caracal and Jackal, with more game to be introduced that originated from the area. The luxury accommodation is unique and very comfortable, a perfect place to own your own peace and quiet during your stay. My wife, Dominique and I setup before sunset, as I wanted to capture the Blue Hour. Springbok congregated around the windmill slaking their thirst just before nightfall. During that time André and Corlia were preparing the most delicious meal for us. 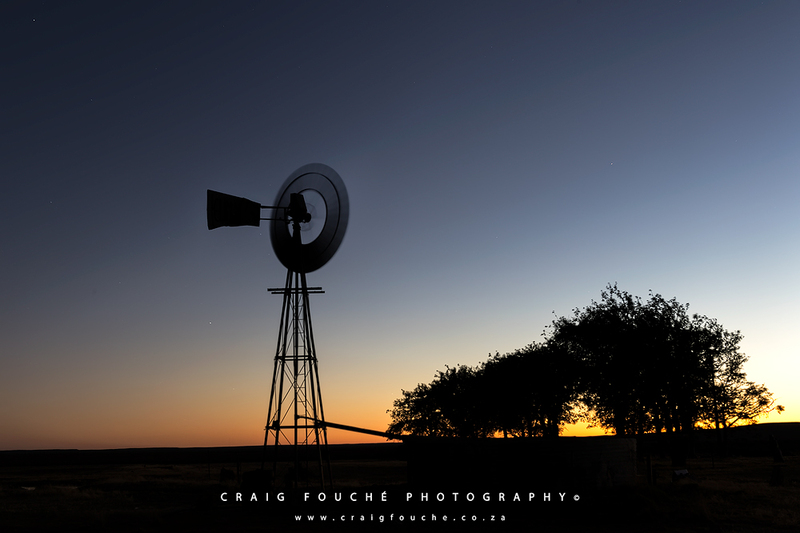 I shot from around sunset to approximately 22h30, in between enjoying the fine dinner and Rogge Cloof’s own locally produced Sutherland wines that had been presented. People always associate the Western Cape with wine, I was very surprised to learn that Sutherland is our only highest-altitude, semi-arid, coldest wine growing region in South Africa. Rogge Cloof boasts 3 wines which are produced using organic practices and are grown on the farm Kanolfontein, the vineyards were planted in 2004. One of the wines is from the Ceres Valley. 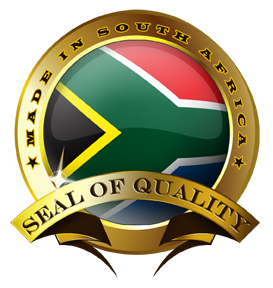 The South African winelands encompass 27 diverse districts and some 77 smaller wards in total. I walked away with a few good images which I am happy with, it wasn’t an entirely dark moon at the time of my shoot, that is why the the foreground was lit up in the way it was. The moon was in the last quarter phase. 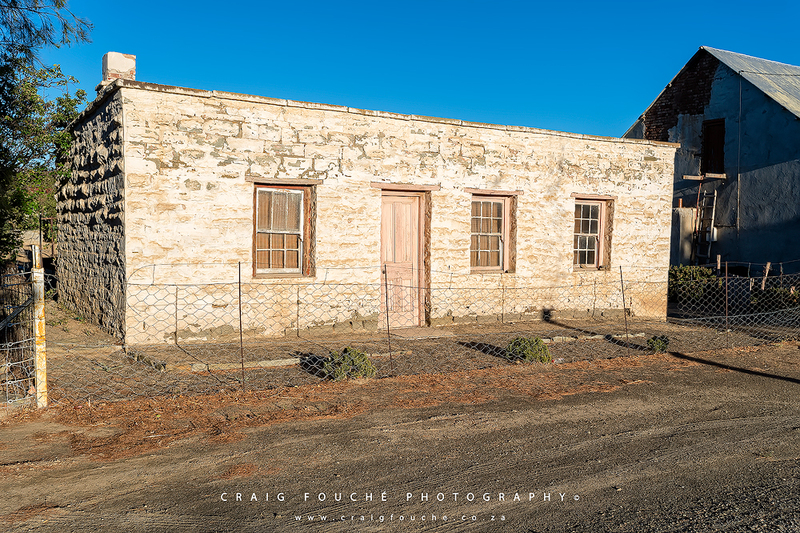 As time was short for us, I want to return again to capture more of what the Upper Karoo has to offer in the other seasons of the year, I have a few ideas in mind, so look out for my next blog on Sutherland when that trip has been completed. 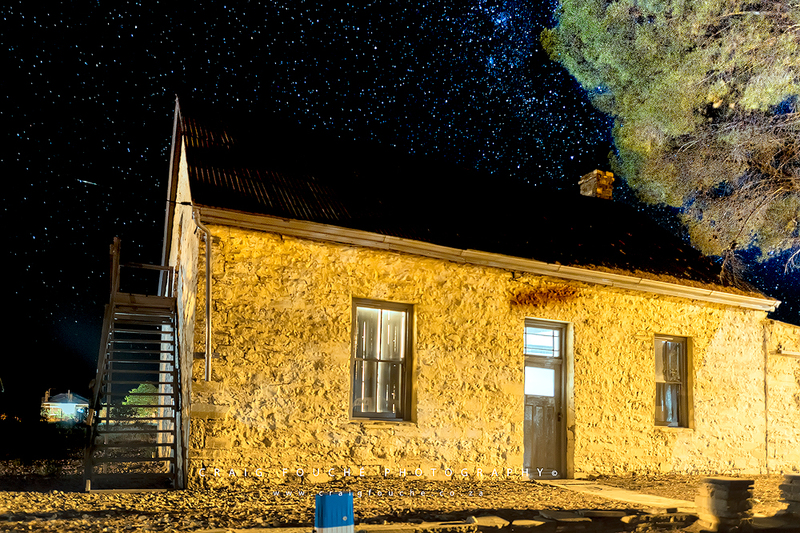 Arriving at The Artist’s Cottage around midnight, after our shoot at Rogge Cloof, I was seriously impressed at how clear the stars shone in town, in spite of the few mercury vapour street lights that lit the streets. Sadly, the next morning after breakfast, we had to return home, but going home refreshed and inspired and all the better for our experiences in Sutherland. As time was short for us, I want to return again, to leave the boundries of my regular radio station behind and tune into something different. I need to spend some more time there to capture so much more of what the Upper Karoo has to offer in the other seasons of the year. I have a few ideas in mind, so look out for my next blog on Sutherland when that trip has been completed. My focus was purely on landscape photography, I did not come away with any wildlife images, even although the birdlife in the area and game at Rogge Cloof is in abundance, I only brought along landscape lenses for this trip, which is another reason for me to return. Special thanks to André and Corlia of Rogge Cloof for your wonderful hospitality, and to Jannie of The Blue Moon, we plan to be back when it snows! Do show some love and support for these two venues should you decide to visit the Upper Karoo, you won’t be disappointed! Information sourced from various sources on the internet: Wikipedia, Rogge Cloof, Discover Sutherland, Wines of South Africa and Badisa for the Koöperasie stories image, all watermarked images are copyrighted and belong to Craig Fouché Photography. There are two gallieries for this blog, a monochrome and colour below. 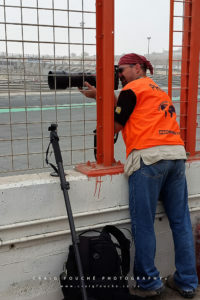 Click on the images below to view an enlarged single image.